I went out to shoot the Canadian on Saturday (Jan 30) and got more than I had hoped for. My kids and I went out in search of the Canadian. I decided to head up to Wilkes Avenue by the Perimeter and shoot it there before heading into town. We arrived a bit early, so I figured I would head west to Diamond to get some of that nice prairie sky. As I approached Diamond (where CP crosses CN) I saw an eastbound intermodal train coming on the north track at 12:09. I pulled over. I could see only one unit on the head end, meaning there had to be a DPU unit somewhere in the train. As the head end passed me, the train started slowing and eventually came to a stop with the trailing engine (CN 2258) just west of me. As the CN train was slowing, I heard a series of horn blasts from the north. After a bit of thought, I realized it could mean only one thing - a CP train on the Glenboro subdivision! The Glenboro sub does not get much traffic these days, and in fact CP intends to abandon some of it. Once the CN train stopped, I raced to the actual diamond to see CP 3106 and 3116 waiting at the light in the distance. They were waiting for the Canadian, which rolled past at 12:24, right on time. Right after the Canadian passed, the CP train proceeded across the diamond and continued south. By then my shooting hand and my toes were frozen, so it was time to go. It was nice to see the diamond get some use! I stumbled across some photos I took back on August 11, 2002 when I visited Lake Louise in Alberta. We stopped at the former CP station there and took a few photos of the passenger cars. While we were there, one westbound CP freight rolled by on the new main track, then an eastbound freight rolled up to the station and stopped. The eastbound had CP 9556 leading, another unit, then CP 9560 trailing. My son and I were invited up in the cab, so we had a quick look around. There are several passenger cars there, including diner Delamere. The station itself is quite impressive. This picture does not do it justice. I hope to get out there next summer and take much better photos of the area... and hopefully see a few trains go by at the same time. I saw a news article in the Sackville Tribune Post that said the Port Elgin railway bridge is being replaced by a "190-foot through-truss bridge with a 12-foot wide wood deck so it will be suitable for snowmobiles, walking and cycling." Port Elgin received a railway connection when the New Brunswick and Prince Edward Railway was completed in 1886 to link Sackville with Cape Tormentine. The NB&PEI Railway was absorbed into the Canadian Government Railways, which became CN. The line was abandoned by the end of 1989, coincident with the abandonment of all railways on Prince Edward Island. Port Elgin was on CN's Tormentine Subdivision, at mile 19.9. The Port Elgin bridge was built in 1917 and was a swing bridge, rotating at its centre to provide passage for boats. I wonder if there any photos of this bridge out there in someone's collection? I saw the modern version of that today. I was driving around the Perimeter Highway today in Winnipeg, intending to catch VIA's Canadian at Wilkes Avenue before heading into the city. As I approached the CP La Riviere track, I saw a long southbound grain train approaching the highway. I could see that it was going to cross the highway before I got to the crossing. I decided to exit and take a shot of it after it crossed the highway. I rushed over to get the shot, and here it is at 12:08. I returned to the highway and got in line for the crossing. The train continued on, car after car, and as I watched I could see it going slower and slower. I could hear the engineer talking with the RTC and the train was in trouble. That single AC4000CW was struggling to pull almost 100 grain cars up the gentle grade. Soon it was proceeding at a walking pace, then a crawl, then ... it stopped. I heard that CP 3116? (or 3118, can't remember) was working a couple of miles north, with another Boyko in the engineer's chair, and I was wondering if Mr Boyko would have to come give this train a push. Suddenly the grain cars started moving again, slowly, then gaining speed, and finally, 17 minutes later, the crossing was clear. The little red engine COULD! Normally I love being stopped by a train, but that was a little much! During this time, I heard that VIA 1 (the Canadian) had stopped at Waverley. It turned out that VIA 6420 was not loading and they had to wait for someone to come look at the engine. The Thursday CEMR train ended up going around them, and I grabbed a quick shot of them as they approached Carman Junction. I stumbled across these photos by Jim Bissell of VIA's Hudson Bay train at this site. I like seeing the old blue and yellow colours. Two Hudson Bays Meet - VIA 692, the southbound Hudson Bay with FP9A 6301 in the lead meets the northbound Hudson Bay, train 693 near Wabowden, Manatoba in September, 1994. By Jim Bissell. VIAs Train 693, The Hudson Bay. Two beautiful FP9s (6302 & 6300) with the Hudson Bay at Thompson, Manitoba in September of 1994. Photo and scan by Jim Bissell. Note the steam generator car behind the two FP9s, and the ex-CP car on the end. Two stories came out on Tuesday involving trains and accidents here in Winnipeg. The first involved a woman's SUV that got stuck on the tracks at a rural crossing and was smoked by a CP train. Fortunately she had bailed out of the vehicle and was unhurt. The second involved a minor derailment at the south end of Symington Yard. The intersection of Fermor and Plessis (near the Fermor overpass over the tracks) was closed for about an hour. The picture in the article shows some tank cars, so perhaps they were concerned about propane or some other material leaking. A CN truck was apparently sideswiped and damaged, and fortunately the occupant was unharmed. I braved the cold today to shoot the Hudson Bay leaving Winnipeg. We had a bit of a blizzard Sunday night and Monday morning, but the roads were mostly cleared by Tuesday. It left a nice clean blanket of snow for the pictures. The brilliant sunshine helped, too. The Hudson Bay got clearance to leave the station downtown at 12:18, about 13 minutes after its scheduled departure time. It rolled past CN 403, in the Fort Rouge yard dropping off a bad order car, before passing me at St. James Junction at 12:29. The engineer in the left hand seat gave me a nice wave. The consist was engines VIA 6458 and 6438; baggage car 8600; coaches 8110 (empty) and 8100; diner 8418 York; and sleeper 8229 Chateau Viger. A fellow in 8100 gave me a wave, too. Soon enough, they were gone and so was I.
Dormitator1 posted a walk-about video showing some Hudson Bay Railway locomotives. Normally I dislike this kind of video, where the videographer moves but the locos don't, but the subject matter is interesting enough to make it worthwhile. Of special interest to me was a glimpse of OSS 3757 at about 1:15 in the video. 3757 is ex-NBSR 3757, a GP9E. CP 4563 is preserved at the Canadian Railway Museum in Delson, Quebec. I had the privilege of seeing her back in 2005, and again in 2007 when she was run to McAdam for the CP Pensioners gathering. mygirl22ward posted a video of a CP single-stack container train near Chicago featuring 4563 as the second unit (and MLW C424 CP 4215 as the third unit). Enjoy. The same user posted a video of the big Alco units that CP ran. This video was shot on May 26, 1993, as the MLW units were fast being retired from CP. Great Alco sights and sounds! I was running an errand Thursday afternoon (Jan 21) and found myself near the CN Rivers sub in Winnipeg. Fortunately there was a train nearby. CN train 312 was heading in with CN 2691 and ex-BC Rail 4619 for power, and I shot it in the flat light. It was a long train, about 120 cars, and it had a rarity, a female conductor. NTTAWWT but it doesn't happen a lot. Right after 312 finally passed, CP 3098 headed south on the La Riviere sub across the diamond. Finally, CN 114 pulled up to the signals short of the diamond and stopped. Apparently CN 312 was stopped up ahead so 114 had to wait. 114 had CN 5525 and CN 5660 for power. This was my first time seeing 5525 but CN 5660 is an old friend. CN ran a special train #316 to bring eight locomotives to Halifax, NS for export to the UK. The train had CN 2529 for power and consisted of eight Euro Cargo "Class 66" locomotives, with an idler flat car on each end. David Othen filmed the train on January 21 at Windsor Junction, Bedford Basin, Fairview Junction, and on the lead to Pier 9 in Halifax. It's an exceptional video, up to David's high standards. I went up to CN Waverley Tuesday (Jan 19) at about 12:30. I saw a westbound container train was parked on the south track near Fort Rouge, and a dim headlight was visible to the west. I learned the container train was CN 101 and it was about to start up. The other train turned out to be an eastbound local, and it paused west of Waverley Street. CN 101 rumbled by with CN 2296 and CN 5274 on the head end. The conductor gave me a nice wave on the way by. I wish I could have waved back but my hands were busy with the cameras. I watched 101 roll by, and then I saw CN 2268 was the distributed power (DPU) about 1/3 of the way back in the train. Once 101 finished rolling by, the local rolled through Waverley Street, with CN 7238, slug CN 238, and two boxcars. They seem to have timed it so they would cross while 101 was still holding the crossing gates down. I was expecting the Hudson Bay to come along, but I heard it was just leaving the station at 12:50 and that was too late for me. BNSF 2001 was replaced as the Winnipeg engine by BNSF 2978 on January 5, 2010. Jeff Keddy reported it and saw 2001 in the CN Fort Rouge yard that afternoon. BNSF 2978 is a GP39V. I saw it in the BNSF yard off Taylor Avenue on Tuesday (January 19). BNSF 2001 arrived in Winnipeg on or near October 14, 2009. I have a special fondness for grain elevators. There's something about these prairie sentinels that stirs the imagination. Standing by railway tracks, they are a unique symbol of the Prairies. Unfortunately, they are disappearing at an alarming rate. In 1999/2000, the Saskatchewan Heritage Foundation, in association with the Ministry of Saskatchewan Tourism, Parks, Culture and Sport, commissioned a study to list all the grain elevators remaining in the province of Saskatchewan. The study found about 800 remaining elevators. Several years later, the study was updated and 543 remained by July 2006. This inventory has those elevators. I should recommend the Saskatchwan Grain Elevator blog and Grain Elevators Canada as good references for photos of Canadian grain elevators. Tim Scammell found these in the Fredericton train station and is curious what they are. The tubular things look like brake hoses but apparently the spikes fit inside them. Any ideas? I was off last Thursday (Jan 14), so my youngest son and I went out to see some trains in the late morning. My intention was to shoot the Canadian then proceed north to CP to see what was up. We went up the Perimeter on the west side of Winnipeg. I heard CEMR 4000 (as CN train 525) report to the RTC that it was off the main line, meaning that it was on the Carman subdivision. Good to know! We west on Wilkes Avenue to a spot near Diamond. I didn't want to stay out of the car, due to the cold, so I set up the video camera and parked facing east. I jumped out of the car every now and then to see if I could hear the train. It turned out that I didn't hear it, so I was a little later getting to the video camera than I would have liked. Still, I think it turned out OK. There were two Chateau sleepers deadheading ahead of the baggage car and behind 6441 and 6425. I took this going-away shot and then headed back to see what CEMR was doing. I found CEMR 4000 and 4002 switching at Oak Bluff at 12:39. It looked like they would be there for a while, so we went to have lunch. When we returned, CEMR was still switching, so we went north back to Wilkes Avenue. I could see an eastbound CN train across the prairie at Diamond so we hustled to catch it. It turned out to be CN 2648 and 5722 leading a paper products / autorack train. After the train passed, we went back south to Oak Bluff and found the CEMR train had just left. We gave chase down highway 3 toward Carman. I had never been in this area before, so I didn't have any idea where the good shots were. However, on the prairies, every shot is pretty good. After about 15 minutes, I was far enough ahead so I picked a spot to leave the highway and went down a rural road to near the tracks. I set up the tripod and we waited for the train to come. Soon enough, CEMR 4000 came into view across the prairie. This telephoto shot shows how the prairie is not exactly flat around Winnipeg, just rolling. We chased it down to Sanford, and then gave up the chase since I had other business to attend to. I'm glad I had this little sojourn down the Carman sub, and I look forward to more railfanning in the area. I decided to try a different spot for Monday's Canadian. I went to where the Perimeter Highway crosses over Wilkes Avenue (and the CN Rivers subdivision). I parked and walked up the embankment next to the highway and set up there. I would have been shooting into the sun, if the sun was actually showing. As it was, it was a pretty good location, except the pole line prevented me from shooting the entire train. As you can see from the shot above, the engineer opened the throttle up to come up to speed after he passed the detector! I swiveled to get the "going away" shot, while the video camera recorded the hotbox message. The consist: 6427, 6421, 8609, 8119, 8512, Fairholme, Fraser Manor, Bliss Manor, Cameron Manor, Chateau Lemoyne, Yoho Park. I'll definitely go back there again. le Soleil is reporting that RailTerm will take over maintenance and operation of the Gaspe rail line from CN in April 2010. The Société du chemin de fer de la Gaspésie (SCFG) owns the rail lines from Matapedia to Gaspé. The SCFG subcontracted maintenance and operation of the line to the Quebec Railway Corporation, and thence to CN when the QRC was purchased in November 2008. Once RailTerm takes over, CN will continue supplying cars and billing customers, but will not be responsible for operation and maintenance of the line. 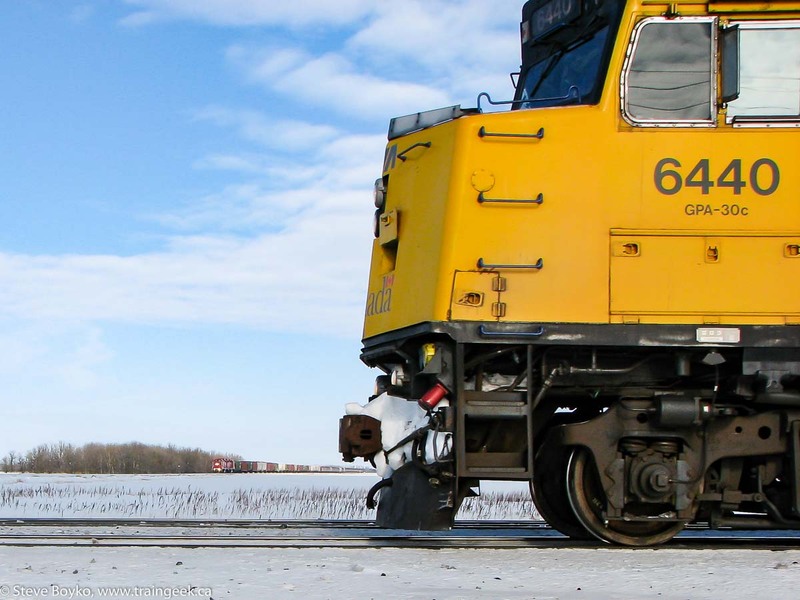 The two major sources of income for SCFG are the Temrex mill in Nouvelle Ouest, and VIA Rail. The SCFG is hoping to get some traffic from the wind farm being built near Gaspé. They expect to save hundreds of thousands of dollars per year under the new contract. On Saturday January 9, I took the kids up to Ware House hobbies (265 Rouge Street, off Portage Avenue). On the way up the Perimeter, I stopped at Wilkes Avenue and bagged a westbound container train at 14:09. The consist was CN 5625, CN 2625, and IC 1024. We had our visit to the train store, and on the way back... another stop at Wilkes, this time for an eastbound at 14:53. CN 5775 and 2539 were pulling a train with loaded paper products and automobiles. I hit end of tape before I saw the end of the train. It was one of those days where the trains showed up right when you wanted them to. That makes up for the days you wait hours for nothing! David Othen has produced a new book, entitled Newfoundland Railway. It is a photo book on the title railway, culled from a visit in September 1976. Check it out! You can order it directly from the web site. Here are two videos by André St-Amant from onboard the Chaleur, from February 2008. The two are a series of photos and videos... pretty nice editing. David Othen posted a video from onboard the Ocean as it rolled through Matapedia. The Chaleur is shown from the Ocean's dome. TJMfishing posted a night video of the Chaleur, led by CN 9416. This would have been from last fall when VIA leased GP40 9416 to help with traction on the leaf-covered line. Thanks for reading my recent series on diesel engines on Prince Edward Island. It was a fun series to write and I learned a lot by doing the research. Here is a list of my research materials. "CNR Diesels in N.B. & PEI"; Gary W. Ness; CN Lines magazine V10N1. "CN's GE 70 Tonners"; Wendell Lemon; Branchline magazine September 2008. "Diesel Study: RS-18"; Leslie Ehrlich, Bill Linley, David Othen; CN Lines magazines V12N4, V13N1, V13N4. "CN Travels on PEI"; John A. Rushton; Branchline magazine December 2008. "CN's Dieselization Program"; Tom Patterson; Branchline magazine March 2009. "Canadian Trackside Guide"; various; Bytown Railway Society. The first book in particular was invaluable and remains the key reference for anyone interested in Prince Edward Island's railway history. I hope Mr. Graham publishes a second volume, or publishes another edition of his excellent book. Previously: 44 tonners, 70 tonners, Fairbanks-Morse units, RSC-13 units. The last type of diesel engine to work on Prince Edward Island was the MLW RSC-14. They arrived in 1975 or 1976 to replace the MLW RSC-13s. Ironically, part of the RSC-13s kept on working on PEI, as most of the RSC-14 units used the six-axle trucks from retired RSC-13 units. The 38 RSC-14 units were rebuilt by CN from MLW RS-18 units between June 1975 and June 1976. The rebuild consisted of replacing the 4-axle trucks on the RS-18 with 6-axle trucks from retired RSC-13 (1700 series) and RS-24 units (1800 series), as well as reducing the horsepower from 1800 HP to 1400 HP by limiting the generator output. The RSC-14 units were renumbered from 38xx to the series 1750-1787. They were not repainted as part of the modification, so some of the RSC-14s retained the black 1961 paint scheme with the CN noodle, and some had the zebra stripes. CN 1753 outside the Charlottetown shops around 1984. Photo by Errol Robertson. Errol Robertson mentioned the following when he was at Charlottetown taking that photo: "At that time there were also three or four unmodified 4 axle Alcos stored in the shop. I inquired about them and I was told that they were stored serviceable waiting for a buyer and they had come to PEI as part of a regular freight, but not running. As I recall they were numbered 36??. Unfortunately there was never enough light in the shop to get a good photo." The MLW RSC-14 units served all through the Maritimes. The lower numbered units worked on PEI, and after abandonment of PEI's railway on December 31, 1989 they went to the mainland. The RSC-14s could be seen on branchlines in New Brunswick and Nova Scotia, and at least one unit (1787) was the standard-gauge switcher at Port aux Basques, Newfoundland. The last RSC-14, CN 1786, was retired in May 1996. Of the 38 units, four were sold to ACINOC in Cuba, one was sold to ALCAN Jamaica, three were sold to the CB&CNS railway (since scrapped), two remained in Canada, and the rest were scrapped. One of the two Canadian survivors is CN 1762, on display in Kensington PEI, and the other is former CN 1754, which went to the Salem & Hillsborough Railroad in 1994 after their disastrous fire, and still remains there in operable condition. It's probably no secret to regular blog readers that I am an Alco/MLW fan, and the RS-18 and RSC-14 are my favourite MLW engines. I think I fell in love with them while riding in the New Brunswick Railway Museum's RSC-14, 1754, and their S-12, 8245. Here's a video I did of 1754 pulling the dinner train back in October 2002, two years before the railroad shut down there. This is in Hillsborough, NB. Click the link above, or the picture below, to view the webcam. I see workers toiling away on the front of the station right now. Amazing. Hat tip to Tim Scammell for posting the link! Previous: 44 tonners, 70 tonners, Fairbanks-Morse units. The next type of diesel-electric locomotive to visit PEI was the MLW RSC-13 units. They started working on PEI in 1967, displacing the Fairbanks-Morse units. The RSC-13 was essentially a 1000 HP Alco RS-1 with smaller fuel tanks, a different cab, with A-1-A trucks for use on light branchline track. CN's RSC-13 units were built between 1955 and 1957 and were numbered 1700-1734. They served for about 20 years, before being retired in 1975 and 1976. I am told the ugly duckling MLW RSC-24 also served on PEI, although I have not found any photos of them there. An unusual sighting was CN 8211 in Borden, PEI on July 1969. 8211 was an MLW S-12 and I did not realize they served on PEI at all. I will wrap up the series next time with the RSC-14s, the last diesels to serve on PEI. I was off work on Thursday, and my son and I were out and about in the afternoon. I figured we could go see a train or two on the CN mainline on Wilkes Avenue. My son was all for this and wanted to see three trains. I promised I would do my best but we had a limited time. I came off the Perimeter at Wilkes and headed in toward town. Soon I saw a headlight to the east, and I turned around to grab the first train. It was paired SD70M-2 units 8820 and 8855 leading a train with empty centerbeam flats and potash cars at 14:40. After that blew by, we headed back into town... to see another set of headlights! This time it was ES44DC CN 2233 and SD70M-2 CN 8825 leading a solid intermodal train at 14:50. We were running out of time, so we had to head down Kenaston. We saw a single CP GP38 working the cement plant off Kenaston, so I guess that was our third train! Joel Scott chased an NB Southern Railway plow extra on Sunday, January 3. They were plowing the main line from Saint John, presumably all the way to McAdam. The video is taken at the crossing in Tracy. The train had plow 402896, NBSR 2319, slug 008, and NBSR 2318. Previously: 44 tonners, 70 tonners. This time I'll write about the Fairbanks-Morse diesels. Fairbanks-Morse was a manufacturing company, started in 1823 with Thaddeus Fairbanks. In the 1890s it started building engines, and it started building railway locomotives in the late 1930s. F-M built locomotives until 1963, and the Canadian licensee the Canadian Locomotive Company continued until 1969. Three Fairbanks-Morse H12-64 diesels arrived on PEI in 1951, numbered 1615, 1616 and 1617. At some point only two remained on PEI, one for each "main line train" in each direction. The H12-64 units were retired between 1957 and 1968. On PEI, they were replaced by the MLW RSC-13 units in 1967. Side note: RDC D302 was tested on PEI in March 1958 but "it proved unsuitable because of difficulties it encountered crossing the ferry ramp, and negotiating the sharp turns between Borden and Charlottetown". EDIT: It is unlikely the RDC ever made it to PEI. I understand it was tested at Cape Tormentine in New Brunswick but had issues with ferry loading. EDIT 2: RDC D302 was indeed tested on PEI in early March 1958 but the tests were not successful. Previously I wrote about the two 44-ton diesels that were the first diesel engines on PEI. CN tried several 75-ton diesels, a Whitcomb design built by the Canadian Locomotive Company (CLC), in 1948. They proved unsatisfactory and were sent back. Shortly thereafter CN purchased 18 GE 70-ton units that were to prove much more successful. The engines arrived in 1950. Later that year, the last steam engine, 1149, left PEI on September 23, 1950. The 70-tonners were initially numbered 7800 - 7817. They were renumbered in 1954 to 1526-1543 and again in 1956 to 26-43. The 70-ton units originally wore the original green and yellow CN switcher paint and evolved over time to the CN black and red paint starting in 1961. I have not seen any photos of the 70-ton units in the "sergeant stripe" livery. These engines appear to have been the mainstay of the island fleet for about 15 years. There are quite a few photos showing two of them pulling mainline trains on PEI. At least a few of the 70-tonners lasted into the 1970s before being retired. A few of them went to the Thurso and Nation Valley Railway (TNVR), a logging railway in western Quebec. Here is a partial list of where the locomotives went. CN 27: retired April 1969, scrapped in Moncton 1972. I was having a good discussion on YouTube about diesels that were on Prince Edward Island, so I thought I would do a few posts on them. I am no expert on PEI railway action but I can summarize from the reference material I have on hand. The first two diesels on PEI were GE 44-ton units 7751 and 7752, built in 1947. These little pocket rockets had a mighty 400 horsepower. I would imagine they were used for switching, not for main line operation. They had their cab in the center, not on the end like most engines. CN 7751 became #7550 in December 1950 and then #1 in June 1956. It was sold in February 1966 and became GWWD 103. In 1994 it was transferred to the Port Stanley Terminal Railroad and became #3, where it operates today. CN 7752 was renumbered to 7551 and then 1501 before becoming CN 2 in June 1956. It was sold to Bowater Mersey Paper in 1965, and went to the Musqudoboit Harbour Railway Museum in Nova Scotia in 1991. There was an article in the Daily Gleaner today about the Fredericton train station. My good friend Tim Scammell was interviewed for the piece. It has been reported that NB Southern Railway engine 2317 has been sent to Canadian Allied Diesel (CAD) in Lachine, Quebec for repairs. Dave Dineen shot a westbound NBSR freight on December 28 with NBSR 2317 as the last engine in the consist. The train had NBSR 2318, slug 008, 2319, 9803 and 2317 with 53 cars. Someone near Sherbrooke, Quebec noted an NBSR unit on MMA train 1 on Wednesday, December 30, so that was probably 2317. Word is that it "threw a rod or two" and is going to get another prime mover and new trucks.